9 years ago today I almost lost my dad. Almost. And I can remember every single detail of that day. Like those that experience tragedy often do. If you haven't had a chance to read his amazing story, please do. It's worth your time, I promise. So today, 9 whole years later, I am thankful to have him in our lives. To have had him walk me down the aisle and dance with me at my wedding. To have him as an amazing father and grandfather to my children. To have him celebrate all the holidays and births, good times and bad. I am so thankful. What an amazing story about your dad. It left me in tears! Another testament that miracles do happen. Such a blessing! Happy WW! I'm so glad you have your dad, and he has you and you shared the story with us! How amazing. Going to check out the post now. Wow, so glad he is okay! I lost my dad to Pancreatic Cancer 4 years ago, I know how tough it can be! So glad yours is still here with you. By the way - you look like him! I just lost my dear dad in August, and I still am in total denial. I'm so glad yours is still with you. What a beautiful picture! I lost my dad nine years ago...you're a lucky lady to have him with you. Thanks for sharing! yes, miracles do happen! and you realize that..lucky you! i am your newest follower..pls follow back if you can. and thanks for the link! We've seen miracles first hand in our family too. I'm so glad your dad made such an amazing recovery. you are blessed! 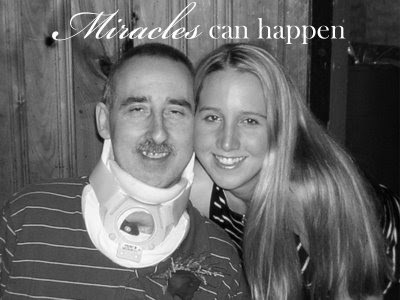 I am also blessed with a miracle daddy... I can't imagine my life with out him. That is incredible!! What a blessing. This is a very special post. It helps remind us to NEVER take our loved ones for granted. What a Blessing!!! Thanks for sharing your story, we all need a little reminder from time to time at just how blessed we are and that miracles really do happen! What an incredible story, Jenni! I was so moved by reading your dad's desire to walk you guys down the aisle. What love! What a sad, but beautiful story! Totally made me cry! Im so happy your dad made it. Are you guys gonna do anything to celebrate next year on the 10th anniversary? You should! Im just so happy for your dad and your family that he is still here!!!!! Although Im very angry about the guy that hit him. Thankyou for sharing your story and may God continue to bless you guys!